Our Gunbelt & Holster in Auburn really hits the mark when it comes to decking out your Wild West wardrobe. Whether you’ve a peaceable engagement planned or expect to go out with guns blazing, this heavy-duty "Buscadero" style gun belt will bring a sense of style and security to your side. Our premium quality tooled leather western drop loop style gun belt includes a matching holster sized for a standard frame revolver, and fits most barrel lengths 4 to 6 inches. Gun belt is stitched from two 1/8 inch thick leather sections, forming a full 1/4 inch finished belt that will stand up to the rigors of daily use. The belt features beautiful floral tooling on the belt, and .44/.45 cal. ammo loops across the back. The holster has floral tooling and a snap closure. Produced in Mexico by skilled craftsmen, this south-of-the-border original was ubiquitous in the 1800's Southwest. Pictured here with our Antique Gray Colt "Peacemaker" pistol replica, sold separately. Right hand draw. Fill up the loops of your gun belt with our deactivated .45 caliber replica bullets. Number of ammo loops may vary. The holster is adjustable for a good fit on your pistol. Click here for instructions on how to adjust the holster. Don't see your firearm listed? Check our Holster Buying Guide for more information, or contact us and we'll research your specific firearm. 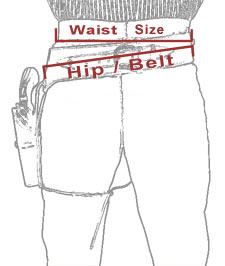 Our gunbelts are sized by "hip" size, not waist size. Measure your hips at an angle, as shown in the diagram here. If your measurement falls between sizes, round up to the nearest even number. Our gun belts are sized in inches, and each belt has a range of +/- two inches from the labeled size. It is VERY important that you measure yourself for your gun belt. DO NOT just select your jeans size, or you will very likely end up with a belt that is too small. I liked the holster and gunbelt. It was too small. I sent it back for an exchange but it was back ordered. I just didn't like it being back ordered. Every part of this product was as you stated in the web site. Good quality leather, fit, and workmanship. The sizing was true to size I did order one size up because I was afraid at the true size it would just fit and there would be no overlap. I was wrong I could have used the true size, the one size up still works so I don't see a need to return for a different size. I'm sure you could buy a fancier belt and holster but unless you are a professional why would you. This holster and belt is very well made, and is sold at a reasonable price. Very Happy! Well made and comfortable. Is indeed heavy duty and Will stand up to some abuse. Even coloring and roll-tooling on belt and holster itself. I ordered this holster a while back and was impressed with the service and the product. This shows very well, is made very well and the price matches the product in my opinion. Ordered and received in minimal time. Very satisfied customer. I couldn't be happier with this gunbelt and holster. It's beautiful to look at and very rugged and well made. I would definitely recommend it to others. I have a 34 inch waist but measured 39" for the wear point and ordered a size 40. A 38 would have put me in the middle hole but I'm using second to the last (just a heads up). The leather and craftsmanship are incredible. The color is almost an exact match to the online photo which doesn't happen very often. My old model Vaquero .44 is a perfect fit in the holster with very little breakin needed. The cartridge loops are tight even with .44 but it didn't take long for them to give just enough. These are the real thing, meant to last and take a lot of punishment doing it. The draw is fast and clean and if you bend the top flap out just a little the return on a spin is perfect. I have ordered from other vendors and gotten a thinner belt/holster with bad color matching that cost more than this rig did. I will be back for more and these are highly recommended. Well made out of heavy leather. Sizing is accurate, holster fits both the pistols I tried. Loops on back are snug on 45LC so they won't fall out when moving around. Very happy with the product. This is a Christmas gift so the recipient has not yet seen it...when I opened the package I was pleasantly surprised and excited to give this to my husband. It is beautiful and everything I hoped for and more! GREAT FIT. VERY NICE LOOKING. GREAT PRICE. GREAT PRODUCT. VERY HAPPY WITH MY CHOICE. great holster, It was to loose fitting for my gun. I can always rely on your staff to help w/ any questions I may have & your garb is always well made & sure to draw compliments. In a nutshell, you rock! Keep up the great work and products guys! this is a 5 star co.i bought a calvery shirt,made in the usa,it fits perfect made with pride.yes I will buy from them again. Very impressed with the Customer Service, Shipping Time and Product. This is my second vest and am very pleased with the craftsmanship and authenticity of them. I'm sure I'll return for other purchases. Thank you for making these products available. Great to deal with...will be back.